Google has released Google Buzz – a social networking platform integrated with Gmail where you can communicate, share pictures, links etc with your friends and followers. Yes, It is similar to Facebook and Twitter but still in initial phase. Few months back, Google launched Wave for real time communications and now Buzz. 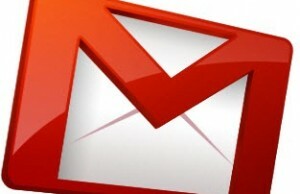 If you are a Gmail user, you can start using Google Buzz from your inbox without doing any setup. It is a social networking platform where you can follow people thru their Google Profile and share your thoughts, findings with your followers. You can share pictures, links, YouTube videos, Google Maps etc using Google Buzz. How to Use Google Buzz? 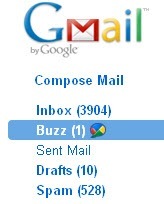 In your Gmail Inbox, you can see a new tab as “Buzz”. If you will click on that, you can see a text box with your profile. Write some text which you want to share with other people, that text will appear on the “Buzz” tab of your profile. You may choose to insert pictures or links thru the options provided at the bottom of the text panel. This “Google Buzz” window under Gmail will get updated with the updates from people whom you are following. 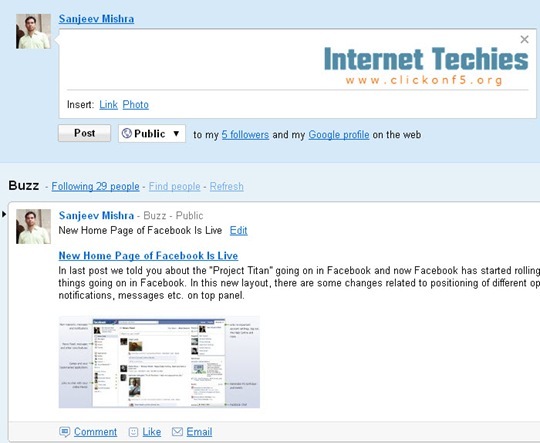 Many people, bloggers has already started using Google Buzz. There are people who think that Google Buzz will not get as much popularity as Twitter or Facebook but as Buzz is still in initial phase, Google may add more features in Buzz in next few months. What is your opinion about this new initiative from Google? Did you start using Google Buzz, if yes then you can follow me on below address.